Even if you think that you live in a safe, crime-free neighborhood, you will never know when criminals or petty thieves might barge into your home. More than just having your personal possessions stolen, it is having your privacy violated and that feeling of safety inside your home messed with that you want to prevent. Fortunately, you can always rely on locks to physically secure your home. For the main door, the minimum number of locks that you should have is two: one is a deadbolt and another one is a regular lock for the doorknob – although you can always convert it into a high-security one. For other parts of the house where privacy is more of an issue than security like in the bathrooms, regular door locks can be used. Key controls are keys which have that added protection of not being duplicated without the necessary tools. When your house keys get into the wrong hands, you are risking the physical safety of your home so consider using key controls. If you do need to have the keys duplicated, get in touch with a professional from locksmith company. Finally, make sure that the locks are resistant from sawing, drilling and picking. There are locks which can be sawed through but only up to a certain point. Drill-resistant locks have hard steel chips inside, while pick-resistant locks have pooled driver pins to discourage forcibly picking locks open. 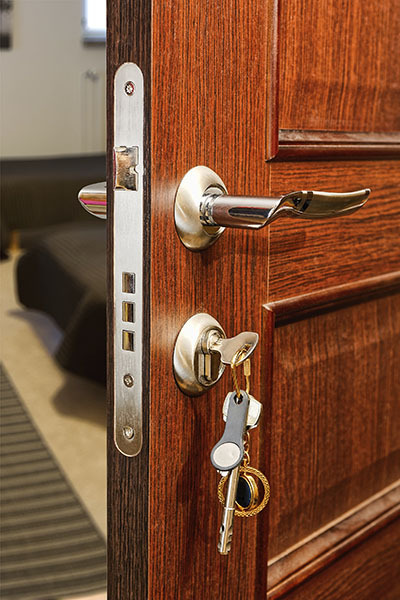 Follow these tips so you can install locks in your doors that will suitably protect the safety of your home.